Five inheritance recipients—in addition to Jill, cousin Rey and BFF Linda—arrive at an eerie (reputedly haunted) Connecticut mansion, primed for a week-long stay. Two-hundred thousand dollars will be awarded to each person, but should someone leave early, for whatever reason, his or her share will be divided among those remaining. The family lawyer passes in the drawing room after dinner. Perhaps he was heavy and out-of-shape, but he never appeared that unhealthy. Enter the sheriff and deputy; exit same, with body, into a misty and frigid November night. The puzzling death prompts the three women to eagerly don amateur sleuth hats. Curious, others soon join in the sleuthing, and the bumbling and stumbling—and mayhem—begin. Enter and exit the sheriff and deputy several more times as the body count mounts . . . until there is no option but to remain. When eccentric and not-so-deceased Aunt Mat dramatically announces a return from the dead, everyone is thrown into a tizzy. That dither intensifies when the grande dame explains that the demise had been feigned to ensnare the person(s) responsible for monetary and in-house thefts. As an ice storm approaches, legal sorts fall mysteriously ill. Tensions mount as fingers point accusingly and tongues flap crossly. The determined investigative trio discover that it’s not only hidden rooms and passageways that conceal deep, dark secrets. 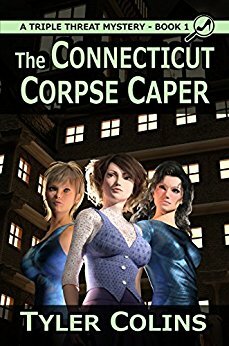 The Connecticut Corpse Caper is the perfect escape for those who love old B&W whodunit mysteries set in creepy oversize mansions filled with quirky guests, hidden passageways, and disappearing and reappearing corpses. He and his sister were alongside us, Rey and Linda ahead, Jensen and May-Lee behind. We had dressed appropriately for the day: jeans, thick sweaters under heavy jackets, decent walking shoes or boots, and hats, gloves and/or scarves. It had gotten much colder since yesterday and even colder since early this morning. The mist that had veiled the area last night had disappeared before dawn. Considering all that had transpired, everyone appeared in relatively good spirits, but then a lemon sun, the crisp smells of fall, and the tranquility of a countryside afternoon could do the soul good. A distant train rumbled and sounded, a couple of horns honked like cross Canada geese, and a trio of playful dogs raced along a neighbor’s property line. “Too bad it’s gone to seed,” Rey said over her shoulder. “Gone to seed?” Percival laughed. “My dear girl, it bloody well always looks like this.” With each passing hour, the man was sounding more and more artificially British. “Not in the least. The Moones have always had eclectic tastes.” He laughed again and motioned her onward, down a winding fine-pebbled path that lead to the rear of the property. Wizened shrubs and weeds -- or maybe the desiccated things had been flowers at one time -- lined the length. “A fish pond,” May-Lee confirmed, adjusting a silk twill scarf with an Inuit motif over auburn waves. “Oh my!” Prunella grabbed her brother’s arm and pointed. “Look Perc, a Western Kingbird!” She nearly jammed the optical instrument into his eyeballs. “A Tyrannus verticalis? You’re sure?” He didn’t sound half as excited, but trained the binoculars where she’d pointed. “It’s gone now.” Percival passed back the binoculars. “But I saw it!” she shrilled. Linda asked what that was. Adwin did a Rey thing and snorted, and sent an elbow not so lightly into my ribs. I reciprocated. Linda bah-hah-hahed (I thought only cartoon characters and drunken barrel-bellied frat boys laughed like that) while Prunella returned to her binoculars. “Did you know pigeons pop?” Linda asked, her expression one of young Lindsay Lohan I-did-no-such-thing innocence. Rey laughed like a kid embarking on her first rollercoaster ride. I grinned like I’d received the compliment of my life while May-Lee turned to the horizon, biting her lip. Prunella lowered the binoculars and appeared appalled, her face as pale as ostrich down. Linda winked and Jensen gave a you-little-vixen look. Tyler Colins is chiefly a writer of fiction and blog posts (but occasionally creates film scripts, and business and sales plans). She’s also a sometimes editor and proofreader. Her fiction focus is primarily mysteries, though she has started to dabble in women’s fiction (weekly installments of Odd Woman Out can be found on Wattpad). Her first book, The Connecticut Corpse Caper, was written as a one-off, but the ever-enthusiastic amateur sleuths pleaded, cried, cajoled, and even offered bribes to return; she had to oblige. Can You Hula Like Hilo Hattie? and Coco’s Nuts! are the second and third in the Triple Threat series. The fourth, Forever Poi, should be available this summer.